With a Peranakan culture influenced by Chinese and Malay origins, Laksa is a spicy noodle dish and usually available either in coconut curry or asam (sour fish) soup base. Typically, rice vermicelli is used what makes it special is due to its 'janggut' nature, where you will not need a fork or chopsticks to enjoy the bowl of delicacy. Toppled with cockles, sliced shrimps and shredded fish cakes, all you need is a soup spoon to scoop it all up! (+) Fresh coconut curry soup base and the fragrance was very stimulating to your senses indeed. (+) Slight gritty texture to the soup due to the grounded dried prawns and spices, complementing the smooth vermicelli. (+) Mildly spicy, which does not upset the stomach, especially if its your first meal of the day. (+) Convenient to eat, since all you need is a spoon to scoop up the goodies in the bowl. (-) Expensive for the serving size at S$3. (-) Depending on individual tastes, personally I would prefer it to be spicier. 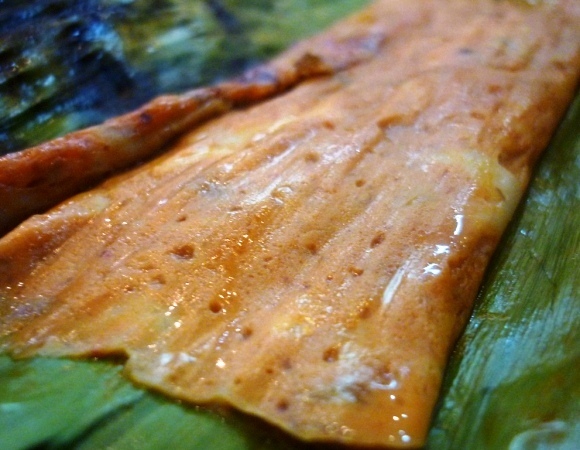 Otah is typically a mixture of spices and fish meat, sliced thinly and wrapped up using a large piece of banana leaf, slow-grilled to perfection over charcoal fire. This delicacy is usually enjoyed as an accompaniment to a main dish, in my case, laksa. Interestingly but not the most appetizing fact to be honest, Otah means brains in Malay language. I try not to associate this thinking when I enjoy this delicious accompaniment to my laksa. (+) The banana leaf leaves a lingering tinge of fragrance on the fish otah and complemented well with the spices and fish. 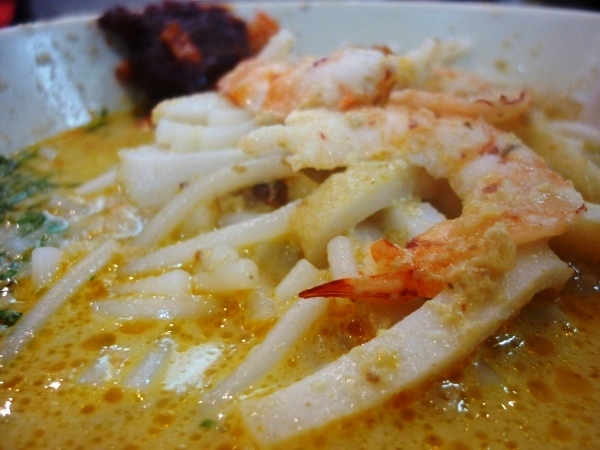 (+) Not overly greasy, which accompanies well with the laksa which itself is slightly oily with the coconut milk used. (+) Does not leave you with a 'fishy' aftertaste, considering the main ingredient being mackerel. (+) The otah is relatively broad, hence portion size larger than the average otah sold elsewhere. Ambience: Nothing spectacular to rave about since it is unlike a usual restaurant. It really is just a kiosk where people 'come-and-go' for a quick meal as you sit alongside others on a long table.